Marriage to an injured soldier-turned-gambler was not what Rahab expected when she dreamed of love. When her husband’s debt becomes more than they can manage, Rahab is auctioned off and begins to live as a prostitute. Even when the prince of Jericho starts favoring her, she still feels dirty and unlovable. Feeling trapped in a life she did not choose, Rahab is hesitant to trust any man. When two Israelite spies seek her help, she chooses to deceive her own people. She has heard all about what their God did in Egypt and in parting the Red Sea. She knows there is something different and real about the God that the spies serve. 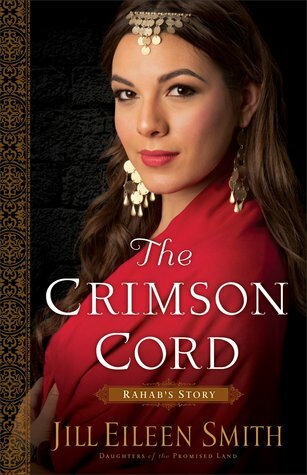 She secures a promise from the spies that their God will spare her life (and her family’s) if she hangs a crimson cord from her window and if she doesn’t betray the spies. Even if what they are saying is true, can Rahab trust them? Can she trust their God to keep His word? Can she learn to trust and love again when she’s been so hurt and misused? Since many people are already familiar with the biblical account of Rahab, I was curious to see how the author explained her lifestyle. I really enjoyed the background story because it painted a fuller picture of who Rahab was and why she was the way she was. I’ve always loved that God chose to use the least likely person and place her in the lineage of Christ. His redemption is so much more powerful when seen through the process she went through. I read through this book in a few hours because I had to know how the author would end the story. I was not disappointed. The characters are authentic and not over-the-top. We see their struggles and failures. I was very impressed with the character development and how the main characters made me want to like them. I recommend this book for anyone who enjoys historical fiction with a biblical background. This is more a story of redemption than a story of romance. I received this book for free from Revell in exchange for an honest review.